It’s a Sunday night in early June and I’m on a mission to win. I’m at Bethany Beach with four girlfriends, engaged in an intense mah jongg marathon. It’s pretty much non-stop. Fortunately, we take a time out for dinner at One Coastal, a cozy eatery in Fenwick Island, Delaware. One Coastal, aptly named for its location at 101-6 Coastal Highway, re-opened last summer under new ownership. It’s an unassuming place with a laid-back atmosphere and food with flair, served up by a capable and congenial staff. 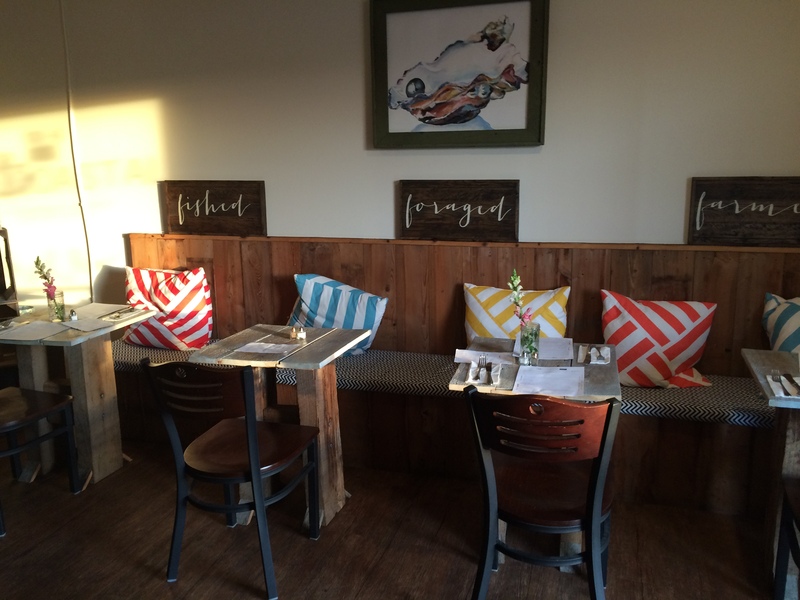 The interior, newly renovated in time for the current season, is rustic meets whimsical. A collage on the wall is created from plates, and there’s artwork crafted from wood pallets. 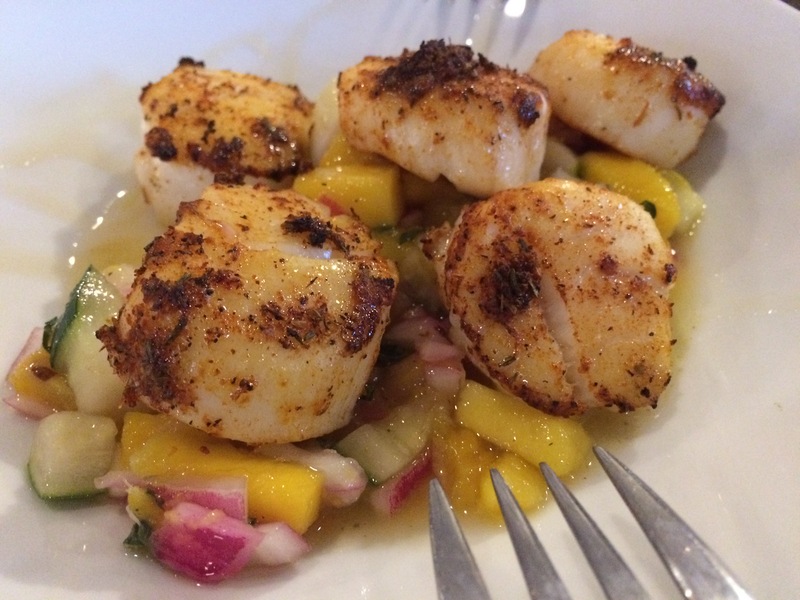 Local purveyors get a shout-out on the menu, including the restaurant’s own One Coastal Farm. Kale + brussels salad is one of several offerings on the “eat your greens” section of the menu. The popular ingredients are tossed with sunflower seeds, diced apples, avocado, and pomegranate seeds. It’s a satisfying way to start. 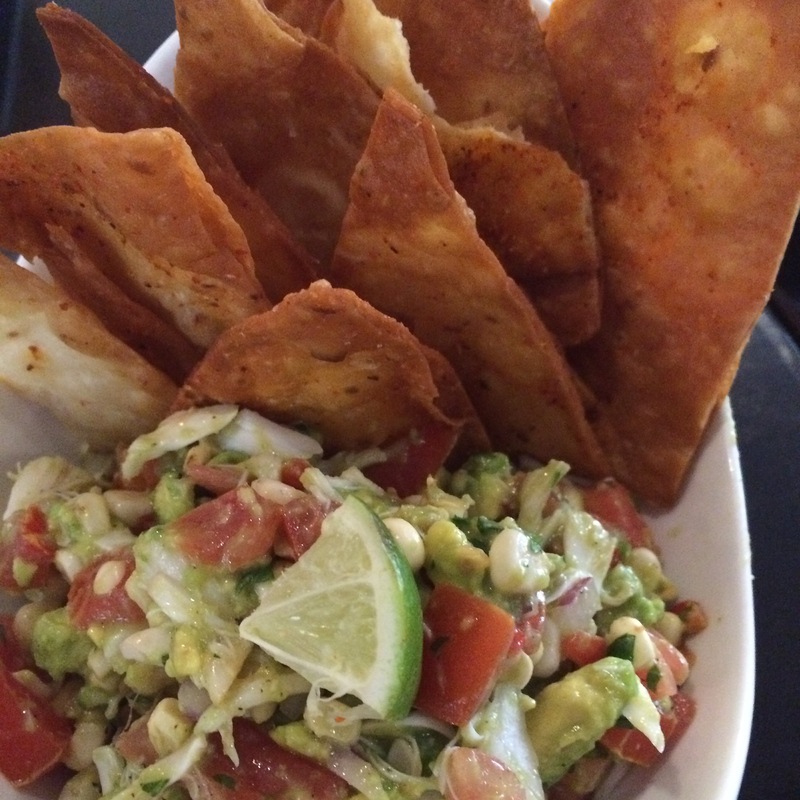 On the “little snacks” side of the menu is an irresistible crab guaca-salsa featuring crabmeat with avocado, cilantro, grilled corn, and house-made tortilla chips. This dish is like crack- totally addictive. The naked taco – another” little snacks” dish – is well-prepared salmon over rice. 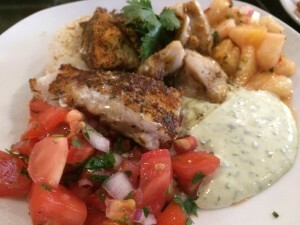 The dish is dotted with lemon basil aoli, pineapple salsa, and fresh pico de gallo. After a few starters…bam…it’s time for the “main event.” Fish at One Coastal is locally sourced, and available seared or blackened. 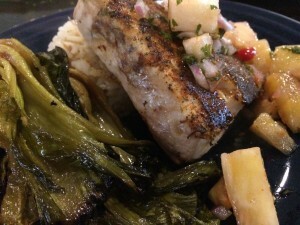 Tilefish is an option, but we’re taking a break from tiles, and order cobia instead. The blackened fish has a strong fishy taste which we all dislike, but the accompanying sesame roasted bok choy wins us over. One Coastal owner Carlie Roberts stops by our table to check in. We praise the food with the exception of the cobia, which prompts the delivery of a replacement dish of delightful spicy blackened scallops. Dishes are a little heavy on the pineapple accents, but on the other hand this serves to showcase a small kitchen that’s maximizing resources. One Coastal is a satisfying beach eatery, worth a visit for breakfast (banana bread french toast! ), lunch (paninis), or dinner. This is a restaurant that’s in to win it, just like me and my mah jongg-loving friends.